CBD Oil Review rates Alaska Cannabis Exchange with two stars because it qualifies for the Mission & Innovation Badges. Founded by a family seeking alternative therapies for epilepsy, Alaska Cannabis Exchange makes some great-sounding claims about their products. If they truly do use a special strain of cannabis bred for its superior CBD genetics, that would be quite impressive. While ACE is ahead of much of the competition by posting even a single CoA, most products do not have any testing done for contaminants, and as such we encourage caution when considering said products. The co-founder of Alaska Cannabis Exchange (ACE) has a niece who is diagnosed with a rare genetic disorder, resulting in dozens of epileptic seizures on a daily basis. 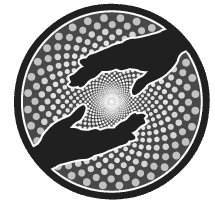 When mainstream (and extremely expensive) therapies and pharmaceutical drugs only caused her to be listless and zombie-like, her parents decided to take things into their hands — personal empowerment! Within days of beginning cannabinoid therapy, the young girl improved measurably and continues to improve to this day. These astonishing results were the genesis of what became ACE. 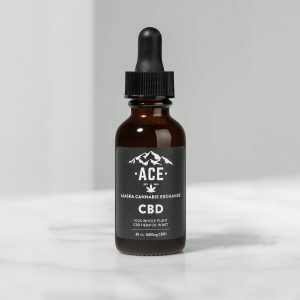 Only three products are available at CannabisACE.com so far: A “whole plant” CBD tincture, a “whole plant” vaping oil and a cannabinoid oil formulated specifically for pets; prices range from $35 to $165. 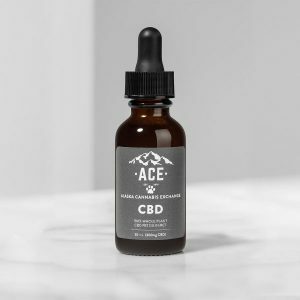 They state under each item that they perform their extractions on “high-CBD genetics,” meaning ACE claims that they use a strain of cannabis cultivated for its rich CBD content, rather than the standard industrial hemp that is more common. If true, this source material would offer a huge leg up on the competition; however, the information provided on their site is too vague to back up such a claim. 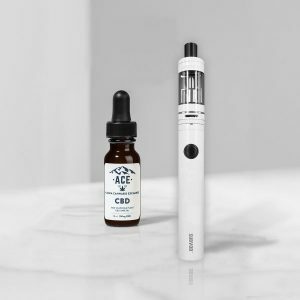 Perhaps the most redeeming quality of ACE is their promotion of the idea of “rebooting,” which is their unique recommendation that one should take 24-48 hours off of CBD every few weeks to hedge against tolerance to beneficial effects. This is a uniquely responsible concept for a company to adhere to, and speaks volumes to the possible ethics of the people running the show. We really love the well-intentioned beginnings of Alaska Cannabis Exchange, and can only hope they continue progressing. Improving upon not only the quality and safety of their products, but also all information relevant to such things would be a major and crucial step forward. Mission Verified – Alaska Cannabis Exchange is focused on delivering alternatives to expensive (and often ineffective) mainstream treatments for chronic conditions. Innovation Verified – Alaska Cannabis Exchange claims to use advanced hemp genetics to get a leg up on the competition and offer a superior product to consumers.